IN LOVE WITH WINE: BORN IN ROMANIA, WITH FAMILY ROOTS IN HUNGARY, ZOLTAN NAGY CAME TO BARCELONA IN 2010 ON HOLIDAY WITH HIS BROTHER, A PILOT, AND STAYED. NAGY FELL IN LOVE WITH THE LOCAL CULTURE AND NOW DOES WINE TOURS FOR TOURISTS IN WINERIES AND RESTAURANTS. 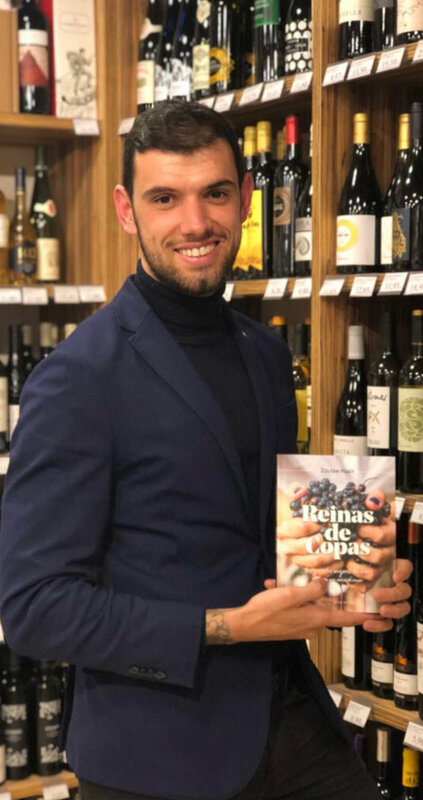 HE IS A MEMBER OF THE SPANISH ASSOCIATION OF WINE JOURNALISTS AND WRITERS (AEPEV IN SPANISH) AND THE INTERNATIONAL FEDERATION OF WINE AND SPIRITS JOURNALISTS AND WRITERS (FIJEV). HE IS CURRENTLY STUDYING TO BE A SOMMELIER ON A DISTANCE COURSE FROM THE PRESTIGIOUS WINE &AMP; SPIRIT EDUCATION TRUST SCHOOL IN LONDON. photo taken in Vinalium, Les Corts, Barcelona. A Hungarian man writing a book about wine and women from here? Yes, it’s an issue I like a lot, and I think that a man’s view of women in this sector, which is so closely related to the land and culture, is interesting. I’ve been involved in bringing tourists to visit wineries here for three years and I’ve come to know this world. Women deserve their own book because of everything they provide to the world of wine. Many things. Sensibility, honesty, passion, a great ability for communication. Women even have more taste buds, which is why they discover new aspects when tasting wines. I’m convinced that the wine world is changing thanks to women. The thing that struck me most about females in this world is realising that women are capable of taking on different tasks simultaneously, and doing them with passion and honesty. It is what I call the octopus girl! For example, Irene Alemany. In fact, I knew she would be essential when I was considering writing the book. She had breast cancer, but is now okay: She is so grateful to Vall d’Hebron hospital that she now makes a special wine called Microscopi to raise funds for cancer research. Irene makes wine in her Alemany i Corrió winery, which is tiny but which creates a big product. She is a passionate, multitasking woman. Despite having children and dogs, she never stops travelling and visiting fairs. I wouldn’t be able to keep up with her. But she isn’t the only one. Sara Pérez, who is from an established wine-making family in Priorat, treats her winery as her playground. She is a true Xena warrior princess of wine. She manages several cellars with her husband, René Barbier junior, with whom she has maintained a great love story that is reflected in their wines, and also with her father, Josep Lluís Pérez, one of Priorats’ best-known names. There are cases of women who give up city life to make wine in the country. Yes, we should be thankful because this generation gives us some lovely wines. One case is Olívia Bayés, who studied in the US and worked as a lawyer in Barcelona, like her husband David Marco, who comes from a family in Porrera with a long wine-making tradition. They decided to give their professions up and focus on their true passion, making wine. They moved to Porrera and started the Marco Abella winery. They are great wine-making ladies with very important exporting companies. Ernestina Torelló is from the 22nd generation of a wine-making family; Mireia Torres runs the Jean Leon cellar and research at Torres, and Mar Raventós has run Codorniu for 20 years. How do you see the consumption of wine in Spain at the moment? I think young people drink more beer than wine because the wine offering is overwhelming. We have to find the way to communicate its value. By the way, so often it is thanks to women there is wine on the table. With this book I also wanted to make people get in their cars and visit wineries and buy wines. In Barcelona, there are lots of people that don’t even know where the nearest vineyard is.